To define the value of a well-known brand marketers like to use the phrase ‘brand equity,’ which is the difference between consumers buying a pair of Nike sneakers instead of the alternative. Some brands lose equity to the vagaries of consumer behavior, while others, bolstered by years of customer loyalty and familiarity, stand the test of time. In a way, countries have their own brand equity, the difference between an investor putting its capital in Cameroon rather than the Central African Republic. The factors that make customers purchase a product are the same that convince companies to invest in a country. Last year, perhaps no African country lost more brand equity than Nigeria. Weakened by a volatile currency, a credit rating downgrade and a simmering conflict with Boko Haram, the continent’s largest economy is reeling. In the second quarter of 2015, its foreign direct investment dropped by 55 percent since the previous year and recorded the worst total since 2007. 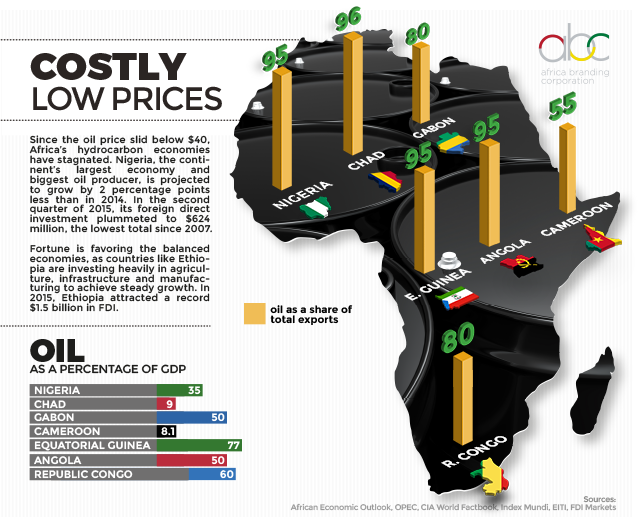 Nigeria’s economic problems have been compounded by an overreliance on the oil industry to fuel growth. The steep decline of the oil price shaved 2 percentage points from its growth in 2015, shelved major investments in the sector and precipitated a loss in brand equity. Nigeria has done a lot to diversify its economy, but oil and gas still make up 35 percent of the economy. The more reliant a country is on hydrocarbons, the more affected it has been by the oil price decline. Overall, Africa’s dependence on resource revenues remains too high, with oil and gas spending accounting for a third of total investments in the continent. The more reliant a country is on hydrocarbons, the more affected it has been by the oil price decline. For example, oil and gas account for three-quarters of Equatorial Guinea’s GDP, which is about to finish its third straight year in recession. Declines in tax revenues puts pressure on governments to reduce public spending, which affects their ability to invest in important things like health, education and infrastructure. In stark contrast, countries like Ethiopia have prospered even without a single barrel of oil under development. On the back of investments in infrastructure, utilities and manufacturing, Ethiopia has averaged double-digit annual growth for more than a decade. Its FDI in 2015 will reach a record $1.5 billion. And perhaps nothing best describes the high value of Ethiopia’s brand equity than what Zemedeneh Negatu, the head of E&Y’s transaction advisory services team, told Financial Times: “Ethiopia is fast becoming the ‘must-visit’ destination for virtually all private equity funds with an emerging market focus.” When the oil price goes down, fortune favors the balanced economies.